It’s officially summer and several developments around town are in full swing. One project we finally have an update on is the Harvest Subdivision. This development is being built south/west of the Empire Ranch Golf Club and is officially moving forward after ground water issues caused construction delays. The project includes 116 homes, six of which will be models and include two product lines. Officials expect construction on the model homes will begin in October and will open to the public in early 2018. Harvest Subdivision homes will range from 2400 to 3957 square feet and vary from 3 to 5 bedrooms and 3 to 5.5 bathrooms. Of the six model homes, only one will be single story, the other five will be two stories. Officials also say prices of the new homes have not been determined yet. Lewis Group is the developer of the new subdivision and CalAtlantic Homes is the builder. In other news, new businesses anticipated to open in Folsom this summer include Five Guys Burgers, which will be located at the Broadstone Marketplace Shopping Center. Also opening later this summer is Lazy Dog Restaurant & Bar at the Palladio, which is now scheduled to open mid-September. If you have any questions about these developments or any other projects, please call us at (916) 912-4843. 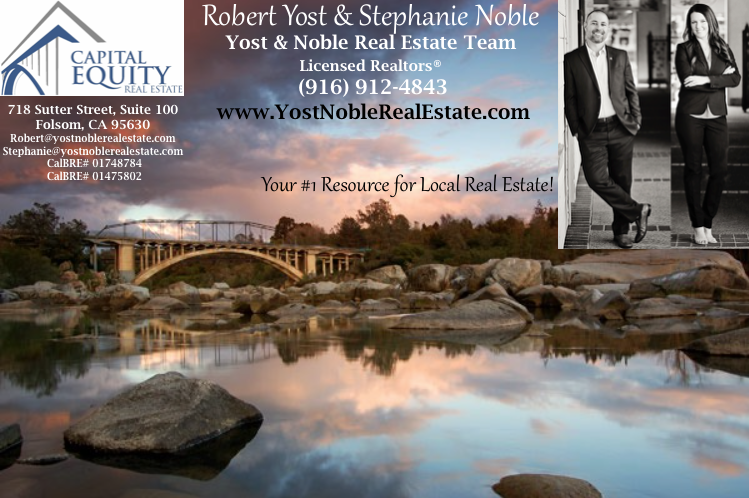 You can also email us at SOLD@yostnoblerealestate.com. Folsom is heating up for summer time! It’s hard to believe 2017 is nearly half way over, but before we can even think about next year, there is so much to look forward to during Folsom’s summer event season. Our area offers a variety of events during the hot summer nights including concerts in the park, brew festivals and much more. Turning to developments around Folsom. Construction is officially underway for the South of 50 Project, which includes thousands of new homes set to be built south of Highway 50. Also happening is a new Starbucks is being built near the corner of Blue Ravine and E. Natoma. New businesses opening in Folsom this month include restaurant chain Wayback Burgers, known for its Triple Triple Burger, which includes nine patties and nine slices of cheese. The eatery is located at 1300 East Bidwell Street and is expected to open mid-June. Folsom housing projects moving forward include Cresleigh Homes on Willard Dr., Parkway Village H on Silberhorn Dr., the Islands on Parkshore Dr. and Harvest on E. Natoma. Officials say soggy dirt and groundwater are causing construction delays on some of them. The beautiful weather is taking over Folsom and we are loving it! Our town truly has some of the best trails and bikeways in the greater Sacramento region. If you’re looking for a new trail to enjoy, check out Folsom’s newest hotspot, the Lake Natoma Waterfront and Trail Access Enhancement Project located off Gold Lake Drive. The trail provides access from Folsom’s Historic District to the lakefront, which includes scenic overlooks and a launch area for canoes, kayaks and paddle boards. Turning to developments in Folsom. Our town continues to bring in new shops, restaurants, and more. Folsom’s Palladio at Broadstone will soon add the popular makeup chain MAC Cosmetics, along with local cake shop Pretty Sweet Bakery. A few other restaurants also coming soon in Folsom include Lazy Dog Restaurant & Bar, Wayback Burgers, and Brisas Do Sul Churrascaria Brazilian Steakhouse. We hope to have more information as opening dates are announced. HAPPY SPRING! Flowers are starting to bloom, days are officially longer, and it’s starting to warm up in our beautiful town. So what else is happening around Folsom? Several new businesses are opening this month, including athletic apparel company Under Armour. Their new location is set to open at the Folsom Premium Outlets on April 27th, according to the outlet website. Life Time Athletic Folsom is also expected to open this month, which is located at 110 Serpa Way. In other news, Folsom is home to the best bakery in California, according to a recent report by Yelp. BJ Cinnamon (located at 402 E Bidwell Street) won the top spot in our state! How awesome is that?! The shop has amazing donuts and pastries! Internet media company BuzzFeed asked Yelp for the most popular bakeries in every state. Yelp used an algorithm that looked at the number of reviews, plus the star rating for every bakery on Yelp, BJ Cinnamon was ultimately the best in California! Another exciting project for Folsom residents is the expansion of Green Valley Road between East Natoma Street and Sophia Parkway. The new plan is expected to begin in spring 2018 and will involve adding an additional lane in each direction, which will help ease traffic during rush hour. Other news we have is city officials say the plan area South of 50 will begin grading work this month. This development includes several projects such as housing and retail plans. We hope to have more information as it begins to develop. Our wonderful city continues to outshine other suburbs around the country! Folsom was recently named one of the nation’s top family-friendly cities, according to a report by rental listing company Apartment List. Folsom came in at number 17 out of more than 500 cities nationwide for the best family cities in 2017. The four factors included in the ranking were safety, housing affordability, education quality, and child friendliness. Folsom’s overall grade was an A, which is well-deserved! Other news we have is the new Sprouts Farmers Market being built at 905 E. Bidwell St. in Folsom is set to officially open on March 15th, according to the company website. The grocery store offers fresh fruits and vegetables, grains, nuts and sweets. Plus, a deli, vitamins and supplements, and natural and organic groceries. We look forward to having another grocery store option in Folsom! Construction on a new 18-acre community began last month at Parkshore Drive and Folsom Boulevard. The $68.5-million-dollar project includes 126 single-family homes within Lewis Planned Communities’ Parkshore Master Plan. BlackPine Communities and Presidio Residential Capital are partnering on this project, which will include modern farmhouse-style homes on 45 by 70-foot lots. 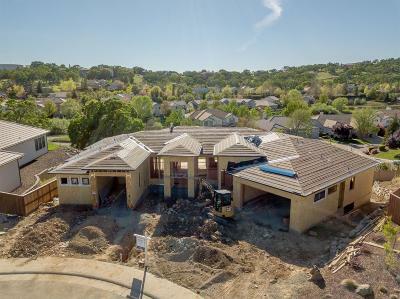 The first homes will be for sale this summer with an estimated completion of fall 2019. Other neighborhood news we have is the southwest corner of Oak Avenue Parkway and Blue Ravine Road is slated for an affordable housing project, according to City of Folsom officials. We hope to have more information on this project within the next few months. HAPPY 2017! We hope you had a wonderful holiday and a happy new year! As we move into 2017, what’s in store for the housing market? Realtor.com recently predicted the greater Sacramento area will be the nation’s fourth hottest housing market this year. This is exciting news for both buyers and sellers in our region! Phoenix, Los Angeles and Boston topped the list. Still, Realtor.com experts say all the top markets have relatively affordable rental prices, low unemployment, large populations of millennials and baby boomers, as well as a high number of listing views on its site. The Sacramento market is projected to have a 7.2 percent price growth and a 4.9 percent sales growth this year. The median home price is estimated to be $420,000. I look forward to seeing how this year's housing market plays out! Turning to Folsom news, more businesses continue to make their way into the area. Another new restaurant set to open in Folsom this spring is Broderick Roadhouse. The locally owned eatery is known for its critically acclaimed burgers and scratch cooking in West Sacramento. Their newest location will open next to the new Mikuni in the Folsom Pointe center at East Bidwell Street just off Highway 50. HAPPY HOLIDAYS! It’s hard to believe it’s almost time to celebrate the new year. Overall, 2016 has been one of the best years for the housing market in nearly a decade, especially in Folsom. From several new businesses to being named the number one place to raise a family in California, our town continues to thrive among the nation’s best small cities. With the amount of economic growth in the greater Sacramento area, we expect this trend to continue into 2017! So what else is coming to Folsom? If you’ve driven on Highway 50 lately, you’ve probably noticed a large development being built near Costco. That project will soon be Life Time Athletic, set to open in early 2017. The state-of-the-art facility will offer full-service spa, a cafe that provides a healthy diet, nationally renowned group fitness and personal training programs, an indoor cycling studio, indoor turf field and cutting-edge fitness equipment. Turning to developments in Empire Ranch. As I mentioned in my newsletter last month, the remaining villages in Empire Ranch have been accepted by the City. Elliott Homes officials provided more information on both their communities in Empire Ranch. Officials say Riata at Empire Ranch is completely released and there are 21 homes remaining for sale. Veranda at Empire Ranch, the new patio home community has 6 homes available in the current release. Officials say the remaining 57 will be released over the next 6 months. Folsom continues to attract new businesses to the area. One hotspot is the Palladio at Broadstone. Several new tenants are anticipated to open there this month, including the new LUXE Cinemas. The upscale movie theater will feature 6 auditoriums with electric recliners, a full bar & menu, a cocktail lounge and an outdoor patio to enjoy before or after your movie. Other businesses expected to open at the Palladio by the end of 2016 are Barnes & Noble, Brazilian Steakhouse Brisas do Sul, Pure Life Juice Company, Grist Beer Hall and Petra Greek. Turning to developments in Empire Ranch. The community will soon be getting its first fire station. Fire Station 39 will be Folsom’s fifth fire station and will serve the northeast area of the city, plus portions of El Dorado Hills. The new station will be built at the southwest corner of Empire Ranch Road and Ritchie Street and will be about 10,500 square feet in size. Officials say construction on the station is expected to begin next year. Other neighborhood news we have is the remaining villages in Empire Ranch have been accepted by the City. HAPPY FALL! It’s officially fall, which means leaves are starting to change colors and drop from trees around Folsom, but what else is happening around town? I know many of us are looking forward to Mikuni: Japanese Restaurant & Sushi Bar to open its Folsom location. The latest information we have is the restaurant is expected to open mid-October. It’s located at 185 Placerville Road, Suite 100, right off East Bidwell St. near Highway 50. Turning to neighborhood projects. Model homes at a new development in Empire Ranch opened to the public this past weekend. The ‘Veranda Subdivision’ is located off Golf Links Dr. Officials say 63 Elliott Homes are for sale and prices are starting at $386,950. We also have an update on the 'Harvest Subdivision’ project in Empire Ranch, which includes 116 new homes south/west of the Empire Ranch Golf Club. Permits have been issued and construction is officially underway. The developer of this project is the Lewis Group of Companies. One project moving forward near Empire Ranch is ‘Parkway Village H.’ This small 19-unit development is located on Silberhorn Dr. Officials say construction should start in the coming months. Many of us are looking forward to the future interchange at Empire Ranch Road & US-50, but how much longer will we have to wait? City of Folsom officials say this project is still in the works, which involves extending Empire Ranch Road south to US-50 down to White Rock Road. The expansion will eventually happen, but not for several years. Officials say the rate of development will dictate when the project will be complete, which may not be for another 10 years or so. Turning to developments in Empire Ranch. A new project called the 'Harvest Subdivision’ is expected to begin construction soon. The plan includes 116 homes and will be located south/west of the Empire Ranch Golf Club.